1/2 L.B. OF MINI PEACOCK ORE CLUSTERS. SIZES RANGE FROM 1/8" TO 1/4". GREAT FOR ADDING A TOUCH OF SHINE TO ANY PROJECT! IT NORMALLY IS A BROWN TO COPPER-RED COLOR BUT TARNISHES TO IRIDESCENT BLUE, GREEN AND PURPLE METALLIC FINISH ON THE SURFACE. 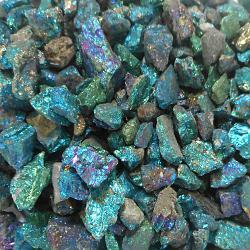 THUS THE NAME PEACOCK ORE. BORNITE IS A COOPER ORE AND OFTEN FOUND WITH CHALCOPYRITE WHICH IT'S OFTEN MISTAKENLY CALLED. CUTTING IS EASILY DONE, BUT IF YOU DO REALIZE THAT ON THE CUT SURFACE IS IT'S NORMAL COLOR. THE BEAUTIFUL IRIDESCENT COLOR IS ACTUALLY A TARNISH ON THE SURFACE AND NOT INSIDE ONCE YOU CUT THE NUGGET.